Recently, both Brooklyn Tweed and Elinor have been examining how past knitting projects have held up to the rough and tumble real world. This has inspired me to share some of my knitting that has made it out of the workbasket and has been worn. The majority of the things I've knitted have ended up being given away. 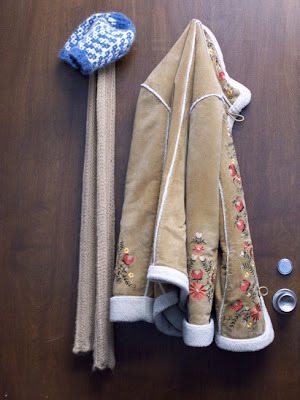 But not the Amazing Alpaca Wonderscarf, shown here hanging on the hook of my new office door (which is the best feature of my new office). Of all of my projects this is the one that I wear the most often, on a daily basis in the winter. It is knit in tan colored Alpaca from Henry's Attic (I think. I bought it from the Yarn Barn in Lawrence, KS), from pattern in an old Interweave Knits. Though you can't tell from this picture, this scarf was my first attempt at lace knitting (wait, no it may have come after the faggoted pillow I made for a friend). Anyway, it was an early attempt at lace knitting. I did not block it out after the last time I washed it. Which is probably just as well, when it is stretched out you can see all of the mistakes that I made. So what makes it Amazing and a Wonderscarf? Well - it is soft. And lightweight. And being tan, it does not show dirt. I made it, wow, about 3 or 4 years ago. And it has not shown much wear, a tiny bit of fuzzying. It does not shed. It has survived being shut into the car door, flapping on the outside of the car as we drove at highway speeds. And I have never lost it, which is an amazing feat. But my favorite aspect of this scarf; I can completely wrap my face up, eyes and all, and still see through the holes created by the lace. I am sure that it looks very strange, but this has come in handy several times when I have been walking through the snow or on super windy days. I think next Halloween, I may dress up as the Invisible Man and this scarf will be perfect for that costume. P.S. The hat is hanging there is one of the parade of hats I posted earlier. Hi Jennifer! Thanks for stopping by my blog. I'm glad your scarf has held up well. I really think we ought to see more of the where-are-they-now posts out there in blogland.